It was one of my best friend's birthday. So, Mel and I ventured to Toronto for shopping and food. You can't shop on an empty stomach! Blasphemy! We hopped on a street car in search of deliciousness. Our shopping destination was Dusk at Queen and Bathurst, so, we were looking for something in the area. It was the birthday girl's choice. After peering in a few places, she decided. It was a yummy looking sandwich shop. We ended up walking into a commercial! The store hadn't opened yet and they were filming! Oops! Hungry, but not out, we wondered back towards Dusk to see what was around. A few shops down from our favourite clothing stop, was Smoke's. 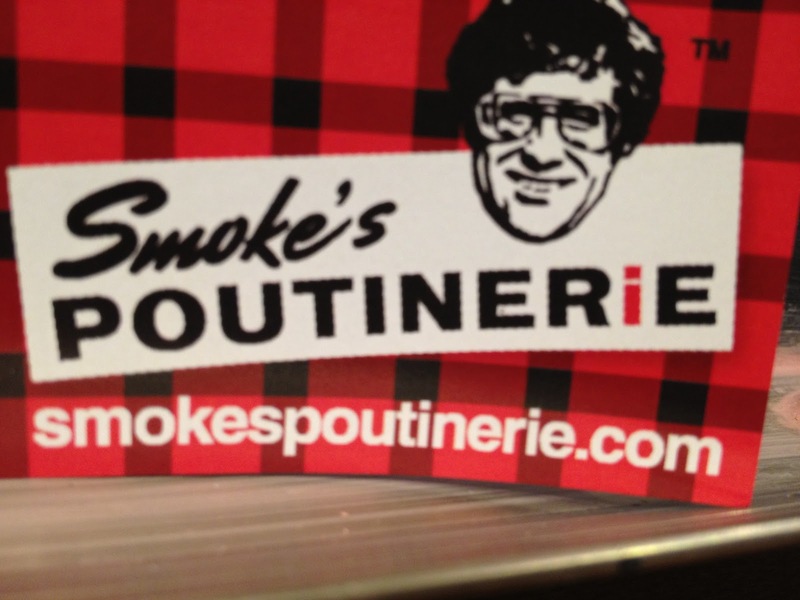 It's a quaint stop with about 10 stools for your poutine-eating pleasure. The prices were very reasonable and they came in 2 sizes, one I can almost finish and one that kinda scares me. The selection was crazy! How could you choose?!!! 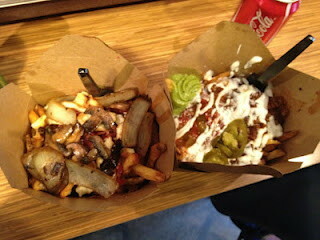 I went with the Country Style Poutine and Mel had the Nacho Grande Poutine. OH-EM-GEE. If I lived near one of these places, I would need bigger pants and a second gym membership. 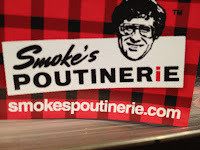 They definitely know their way around a poutine. Mel and I didn't talk much unless you count MMMMMMMM. The ratio of toppings to fries was about 1:1. Neither of us were able to conquer our meals, but we did not leave unsatisfied. We began to rethink eating before shopping for 2 reasons, we wouldn't fit into our size...and we feared napping in the change room. If you're in the Fashion District and need some cheap eats, stop by Smoke's and you will leave with a smile.